This is one of the camps where my dad, his older brother and nieces and nephew were imprisoned in during World War II. One nephew (my cousin Bobby) also died here in 1943. 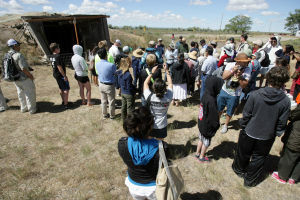 DREW NASH • TIMES-NEWS National Park Service guide Anna Tamura, center, speaks during a tour June 22, 2013 at the Minidoka Internment Camp near Eden. Around 200 people made the annual trip this year. EDEN • Louise Kashino remembers windy days as a teenager at the Minidoka Relocation Center when the dust would fly up and sting her eyes. At the camp surrounded by barbed wire, it would make it hard to see anything. 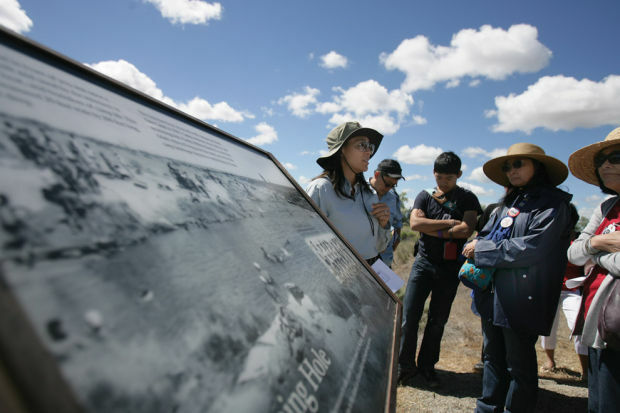 Saturday, the weather conditions were much the same as in the 1940s, as the wind whipped the tall grass at what’s now the Minidoka National Historic Site. It’s still difficult to believe this really happened. Thanks for sharing the education Koji. I often think of a local doctor who lived in one of those camps. He wrote a wonderful book about his experiences. I too pray something like this doesn’t happen again.